It’s no secret that water is extremely beneficial to the body in many different ways. In fact, your body mass is made up of 50 to 70% water. Through sweat, urination, bowel movements, and even breathing, your body loses water every day, which is why replenishing your fluids is crucial. Water helps your body stay hydrated and cool, it keeps you healthy, and it can work wonders for your skin. 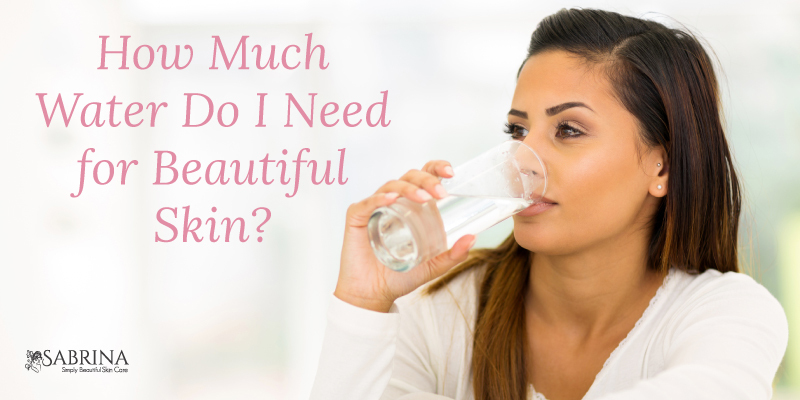 Many suggest that drinking plenty of water each day can improve your complexion, reduce signs of aging, prevent dry skin, and provide even more benefits that you may not realize. But how much water should you drink per day? What exactly does water do for your skin? Here are a few points about water and how it can positively impact your overall health and your skin. Your skin is made up of thousands and thousands of skin cells. Because cells found in your other organs and all parts of your body, including your skin, are mostly water-based, cells need water to continue to thrive. 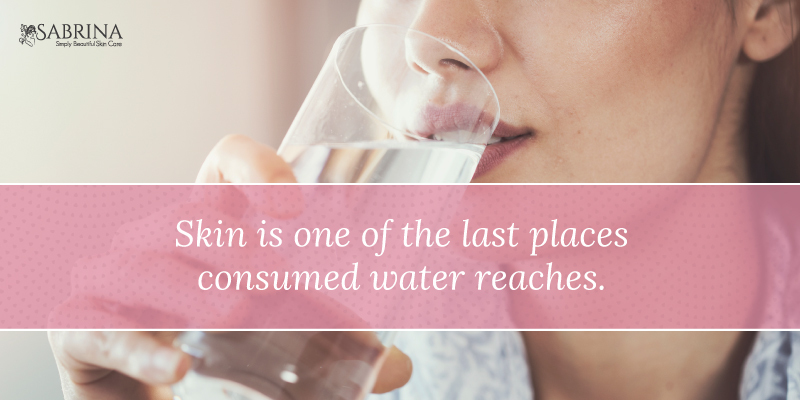 When you are not drinking enough water or properly hydrating your skin, it can become dry and flaky, leaving the dead skin cells to fall off more frequently. This can also cause your skin to wrinkle more easily and prematurely, especially in areas of the skin that are prone to motion. Also, it’s important to note that your skin is one of the last of your organs to receive water. When you drink water, it will make its way to other parts of your body and your internal organs, leaving the skin as one of the last places it touches. This is why replenishing your fluids and making sure you are drinking enough comes in handy. Because your cells are made up of water and your skin and body need water, it can be more beneficial than you may think. 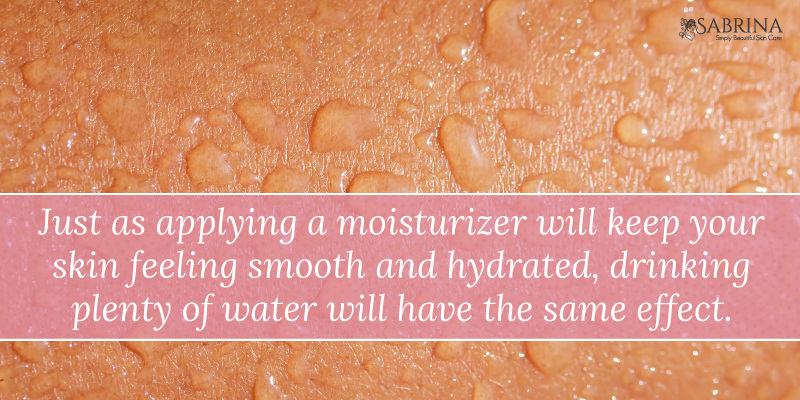 Just as applying a moisturizer will keep your skin feeling smooth and hydrated, drinking plenty of water will have the same effect. This is especially true when it comes to reducing the appearance of fine lines, wrinkles, and other signs of aging that creep up due to lack of hydration. Because your skin can easily dry out without a sufficient amount of water, your skin can flake and wrinkle. Those who skip out on water or don’t drink enough of it will notice that their skin ages much faster than those who drink a sufficient amount. This also goes for people who don’t stick to a skincare regimen, use the wrong products, or skip important steps like moisturizing. So, because you need water to refresh and hydrate your skin and your skin cells, and because the skin is one of the last places consumed water reaches, how much water should you be drinking per day to keep your skin healthy? Health experts generally recommend that everyone should drink eight, eight ounce glasses of water, which ends up being about 2 liters or a half gallon. This is the average amount, but this can vary person to person depending on factors like height and weight. Some argue that you should sip water in small quantities throughout the day, while others say taking larger gulps when you’re thirsty does the trick. At the end of the day, the amount you drink is up to you and your body’s needs. Drink when you feel thirsty. If you’re feeling full, stop drinking. If you’re sweating, exercising, spending time outside in the heat, or feeling dehydrated, make sure you have water with you. Water is essential for your overall health, including your mind, body, and your skin. Because water can prevent your skin from premature aging or more defined wrinkles, making sure you are replenishing your fluids frequently during the day can provide your skin with many benefits. However, water alone will not be able to keep your skin looking youthful and vibrant. This is where a hydrating, anti-aging product will boost your skin’s hydration, fill in those fine lines, and leave your skin looking and feeling healthy and youthful. If you’re on the hunt for the perfect face cream with those anti-aging properties, look no further than the SABRINA Collagen Rx Plus Anti-Aging Face Cream. This product is formulated with apple stem cells and marine collagen to minimize the appearance of pores, fill in wrinkles, fade age spots, and reduce acne scars. With your eight, eight ounce glasses and the anti-aging face cream, you’ll find yourself with happy, healthy, vibrant, and youthful skin.